The United States is in the middle of an energy revolution. In 2018, U.S. production will exceed 10 million barrels per day (bpd) for the first time since 1970. The key to this transformation has been new technology: hydraulic fracturing, automation and other new methods have allowed U.S. companies to beat the odds and out-compete the OPEC states. But for U.S. energy to prosper, technology has to keep pushing the envelope. That’s where Petroteq Energy Inc. (TSX:PQE.V; OTCQX:PQEFF) latest breakthrough oil sands technology comes in. This little energy tech company is potentially sitting on top of billions in oil assets, and it’s embracing the latest tech trend to transform the industry. Right now, Petroteq has two big licensing opportunities in oil sands and proprietary blockchain software, and it’s poised to make some huge profits if both opportunities succeed. First, through a new, clean and innovative method Petroteq will unlock the oil sands of the Western United States, and it is currently sitting on a field of 87 million barrels of oil equivalent: at current prices, that’s worth $5.2 billion. Second, it’s brilliant blockchain subsidiary Petrobloq could add huge value if it fulfils its potential and develops a blockchain supply chain management tool. With plans in motion to tap into U.S. oil sands that so far have been too expensive and dirty to exploit, and the federal government giving its full support for U.S. energy dominance, investors will want to pay immediate attention to Petroteq’s bold strategy. Petroteq is, first and foremost, a tech company. Rather than chasing after profits in traditional upstream, midstream or downstream sectors, the company is focused on developing bold new strategies for unlocking energy resources. Their approach is two-fold: exploit oil that has remained untouched through unique technologies, and then license that tech on to other firms looking to repeat their success. One area that Petroteq is making the most progress is in oil sands extraction. The State of Utah has more than half of all U.S. oil sand deposits, equal to 32 billion barrels of oil equivalent (boe). So far, little has been done to develop this resource, mostly because up until now oil sands exploitation has been dirty and expensive. The tar sands of Canada, for instance, were so dirty and costly, some majors had to divest from the fields altogether. But Petroteq plans to change that. It’s bought the rights to exploit a huge deposit of an estimated 87 million boe equivalent of bitumen in eastern Utah. The field has excellent access to local infrastructure, and once planned production begins in earnest Petroteq should have no problem in moving the oil to markets. At current oil market prices, the field’s oil has gross value of up to $5.2 billion. That’s big news, for a company with a $85 million market cap. Moreover, the oil locked away in Utah oil sands is of major significance to President Donald Trump’s $1.5 trillion infrastructure plan. With much of that plan focused on rebuilding and repairing America’s crumbling bridges and roads, demand for diesel fuel (necessary for road-building rigs) will likely spike. Oil sands also produces a lot of bitumen, which is needed for road construction. Utah’s oil sands are easy to access, with much of it less than 400 feet below the surface. To overcome barriers to safe and profitable oil sands exploitation, Petroteq has developed proprietary methods that could revolutionize how dry oil sands production is practiced. The company’s unique Liquid Extraction System unlocks oil sands deposits without producing a lot of excess waste. Petroteq (TSX:PQE.V; OTCQX:PQEFF) can make oil sands marketable: per barrel costs are expected to come in as low as $22. The process is so clean, climate activists will find nothing to complain about. Petroteq acquired Asphalt Ridge for $10 million and immediately began experimenting with its new tech. In 2015 10,000 barrels were produced, and currently Petroteq is able to squeeze one barrel for every ton of sand, with excess sand carrying only negligible amounts of residuals, well below environmental standards. By the end of March the company expects to produce 1000 bpd. The plan is to reach 5,000 bpd by 2019. Once the tech has been fully tested and proven economic, Petroteq’s next step will be looking to license it out to other firms eager to apply it to dry oil sands fields all over the world. The potential for mass application of Petroteq’s (TSX:PQE.V; OTCQX:PQEFF) new technology is vast. Canada alone has 100 billion boe of oil sands, and worldwide reserves are estimated at 500 billion boe. Utah, Colorado and Wyoming together hold about 1.2 trillion boe in oil sands and shale, worth a combined $72 trillion at current market prices. Canada has $6 trillion worth of oil sands that are ripe for safe, inexpensive exploitation through Petroteq’s new methods. If it can license its methods in other countries, Petroteq could see this side of its business explode. Petroteq’s (TSX:PQE.V; OTCQX:PQEFF) second energy tech advance is in blockchain. It’s where the industry is headed... and it could change it forever. Technology originally used to support cryptocurrencies like Bitcoin, blockchain solutions are now being applied across multiple industries. The tech basically works to ensure secure transactions between parties without a lot of third-party involvement: verifications are done through blockchain technology. Deals that take weeks instead take hours, or even minutes, to secure. And there’s no need for expensive middle-men. And now, oil and gas could get in on the action. Majors like BP, Shell and Statoil are pursuing blockchain solutions. Their goal is to create a secure, real-time blockchain-based digital platform, one that can manage real-time energy transactions without all the hassle, paperwork and inefficiency of traditional deals. Deloitte released a report outlining all the possible ways blockchain could be applied to oil and gas. The major problem Petrobloq is designed to tackle is the difficulties oil and gas companies encounter when putting together supply chains in constantly changing geopolitical conditions and shifting regulations. Services to streamline such efforts cost a lot, and costs can multiply at times when prices are low. That really takes a bite out of profits. In January Petroteq reached an agreement with Pemex, the Mexican state-owned oil company. Through its Petrobloq subsidiary, Petroteq will put together a supply chain management system for Pemex that could radically improve efficiency. Once it’s been built up, Petrobloq is planned to function as a digital ledger for oil and gas transactions, one that could become widely-used throughout the energy industry. And Petrobloq has already attracted attention: it was recently cited by Geoffrey Cann, director at Deloitte specializing in oil and gas, as a contender for best blockchain tech in the energy sector. The biggest names in the industry are getting ready to fully embrace blockchain, which puts Petroteq and its new technology in a unique position. Petrobloq is planned to have the capacity to act as a central ledger for thousands of oil and gas transactions, with unique tokens used for exchange. The management at Petroteq (TSX:PQE.V; OTCQX:PQEFF) is a cut above the rest: they know the energy sector and the world of blockchain intimately. CEO and Chairman Alexsander Blyumkin has invested millions in the business, including an interest-free loan for the production facility at Temple Mountain in Utah. CTO Dr. Vladimir Podlipskiy is a 23-veteran of chemistry, manufacturing and R&D. He’s an expert on extraction, and has pioneered the company’s innovative solution for oil sands production. He’s already secured patents for a variety of different methods. President Dr. R. Gerald Bailey, the former Exxon president of operations in the Arabian Gulf, is dedicated to environmental protection: he firmly believes in Petroteq’s mission to extract oil sands in a clean and affordable way. Petroteq (TSX:PQE.V; OTCQX:PQEFF) is unlike any other energy tech company out there. It’s sitting on top of unique oil sands extraction technology AND a planned revolutionary blockchain-based supply chain platform that could drastically cut costs for the energy industry. And Petroteq doesn’t need to take on the risks normally associated with oil and gas or blockchain ventures. Instead, the company can license out its tech to other companies. Oil sands extraction could be worth trillions. Petroteq itself is sitting on an estimated 87 million boe bitumen, worth $5.2 billion if extracted as oil and sold at today’s market. But once its tech starts to expand worldwide, the company’s assets could be worth a whole lot more. Think of it like this: 500 billion boe trapped in oil sands is worth $30 trillion. 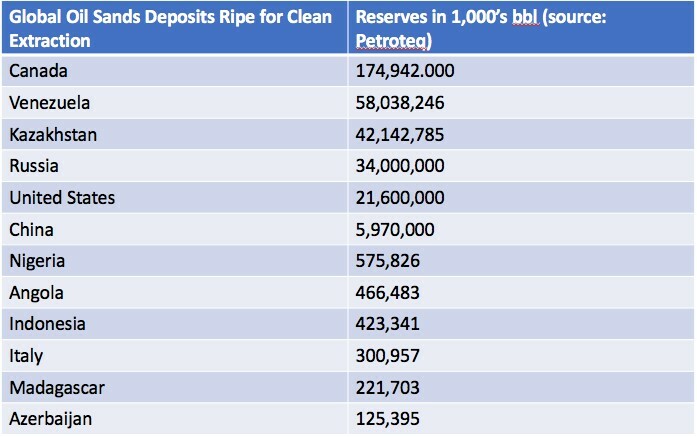 And if proven to be successful, only Petroteq’s method is thought to be cheap and clean enough to unlock that oil. Plus, that heavy oil could soon be in high demand. That means Petroteq will be extracting oil at a targeted $22 in costs, and should be able to sell at world $60 prices, which may even climb to $70 or higher. The potential for blockchain licensing is even greater. Petroteq already has a deal with Pemex, Mexico’s largest energy company, and once developed, the Petrobloq platform is being designed to act as a digital ledger for thousands of oil and gas transactions. As other majors start to take blockchain-based supply chain management seriously, Petrobloq could emerge as a key player in the energy blockchain space. That makes energy tech company Petroteq (TSX:PQE.V; OTCQX:PQEFF) unique. The company has embraced the blockchain revolution, and is sitting on huge potential. Pengrowth Energy Corp. (TSX:PGF): Another company that looks to have halted its falling stock price and is now preparing to ride the bullish sentiment in oil markets. Having shed a lot of excess weight this year in massive asset selloffs, investors can expect a much leaner and meaner Pengrowth in 2018. Pembina Pipeline Corp. (TSX:PPL): The North American pipeline industry has had a tough year, but the recent approval of the Keystone XL pipeline route and the growing need for transportation capacity should act as a boon for the sector. TransCanada (TSX:TRP):is a major oil and energy company based in Calgary, Canada. The company owns and operates energy infrastructure throughout North America. TransCanada is one of the continent’s largest providers of gas storage and owns and has interests in approximately 11,800 megawatts of power generations. Franco-Nevada Corporation (TSX:FNV) specializes in securing precious-metal streams, but the company also works in the oil and gas industry. With key assets in some of North America’s most desirable oil and gas plays, including Texas, Oklahoma and Alberta, it is clear that the company has amazing potential in the coming years. Celestica Inc. (TSX:CLS) is a manufacturer of electrical devices used in IT, telecommunications, healthcare, defense and aerospace industries. The company has seen strong growth YoY which we expect to continue as the sales expectations are almost 3% better than last year’s. This news release contains forward-looking information which is subject to a variety of risks and uncertainties and other factors that could cause actual events or results to differ from those projected in the forward-looking statements. Forward looking statements in this release include that PETROTEQ will be able to produce oil as currently scheduled, at the rates of production announced and at the targeted low prices from its Utah property; that PETROTEQ’s technology results in much lower environmental damage; that PETROTEQ will successfully develop a blockchain supply chain solution for the oil industry; that it will have customers and contracts for its supply chain technology; that oil will be as much in demand in future as currently expected; that PETROTEQ’s technology is protected by patents and that it doesn’t infringe on intellectual property rights of others; that PETROTEQ will find licensees for its technology and that it can patent its technology in many countries; that PETROTEQ’s technology will work as well as expected; that blockchain technology will help PETROTEQ achieve its goals; and that PETROTEQ will be able to carry out its business plans. These forward-looking statements are subject to a variety of risks and uncertainties and other factors that could cause actual events or results to differ materially from those projected in the forward-looking information. Risks that could change or prevent these statements from coming to fruition include that the Company’s patents and other technology protection are not valid, patents may not be granted in countries where PETROTEQ wants to license its technology; production of oil may not be cost effective as expected, technology development costs may be much higher than expected, there may be construction delays and cost overruns at the production plants, PETROTEQ may not raise sufficient funds to carry out its plans, changing costs for extraction and processing; technological results based on current data that may change with more detailed information or testing; blockchain technology may not be developed to be as useful as expected and PETROTEQ may not achieve its business plans; competitors may offer better technology; and despite the current expected viability of its projects, that the oil cannot be economically produced with its technology. Currently, PETROTEQ has no revenues.